Karuna Prison Yoga was established as a 501(c)3 in February of 2017 to bring yoga and mindfulness practices to incarcerated men and women. After volunteering with the San Quentin-based Prison Yoga Project for nearly three years, founding director Angela Still created this specific organization to better serve South Carolina's underserved communities directly affected by the trauma of incarceration. We are a growing community of yoga professionals in this new and expanding field. 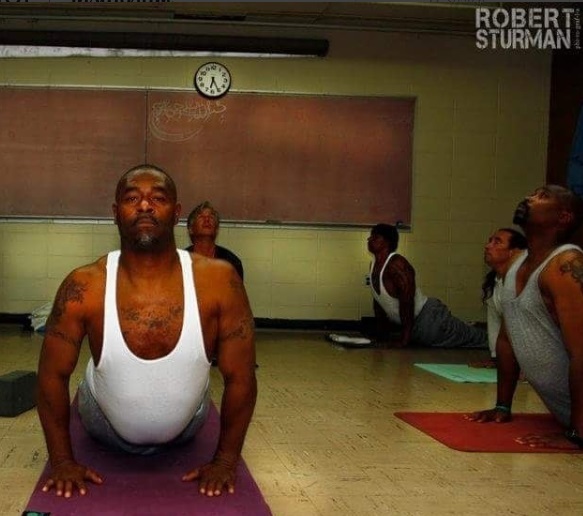 As an affiliate of the Prison Yoga Project, we use a variety of techniques to teach inmates and related populations to cope with the trauma of incarceration. The one thing that I do better than anything else professionally is time management. As a full-time high school English teacher, a college yoga instructor, nonprofit director and prison and recovery yoga instructor, I have no choice but to manage my time effectively in order to be able to achieve all my goals. Many times people ask me how I do all I do. The answer is that I try my best to live in the present moment. Fulfilling so many different roles does require some pre-planning and goal setting, but I try not to focus on the future and where I am going because if I did, I would feel overwhelmed. Living in the present helps me to accomplish everything in smaller, more manageable steps. Ma Jaya spoke about Intentional Depression. That is depression that overtakes us when we set too many lofty, unmanageable goals and fail to reach them. I set big goals, open to change, and then smaller goals that will allow me to advance toward that modifiable larger goal. I believe that every aspect of our lives is constantly changing, and I use that to keep me positive and focused. The best version of myself emerges when I am in a supportive and encouraging environment. That has not always been the case, so I try to surround myself with positive people who have a similar energetic makeup to me. I am deeply passionate about anything I create, and I want to be with people who lift me up, not drag me down. We all need to feel validated, and when I feel accepted and validated and my work is recognized as meaningful and important, I want to continue to better myself and what I am doing. In a world where there is so much negativity and competition, people need to see goodness still exists. Taking yoga to an underserved population and seeing the tangible changes that take place when I’ve invested time in other humans inspires me to continue doing what I am doing and working hard to expand what I have created thus far. I aspire to expand my yoga nonprofit in the coming years as well as pioneer new programs and research in the science of yoga in my state of South Carolina. Yoga is so new and largely unregulated in the West and especially in the South where it is looked on with curiosity and judgment in many areas. I believe there is a whole new world of academic yoga and populations that can benefit from yoga. I’ve taught public school for 27 years, and as a older mother (I birthed my last child at 40), I am not ready to retire from working. In the state of South Carolina, public school teachers can retire at 28 or 30 years, and I am very close. I would love to make academic yoga my second career. I am unable to pinpoint a single success. I believe that everything works together and comes to fruition in time, ultimately resulting in our greatest success, which may not even be realized yet. Any person who is striving to be better than he or she was the day before has not yet tapped her full potential. If I had to pick one defining moment, it would be establishing my nonprofit Karuna Prison Yoga in February of 2017. It was the first time in my life that I created something unique and personal, that was fully my own doing. While a nonprofit can’t be owned by any one person, it was the culminating event that resulted from all my individual life achievements. Every role I play or have played in my life has contributed to this resulting nonprofit. In yogic terms, this is called Svadharma: the one role we are destined to fulfill in our lives. My Masters degree in rehabilitation counseling, my years as an public school educator, my role as a college, prison, and recovery yoga instructor have all contributed to my finding my Svadharma. I have had a string of challenging moments in my life, each leading to a new aspiration. I have been married two times, divorced two times, suffered from exercise bulimia and alcoholism, and a host of other behaviors that haven’t always served my best interest. I wouldn’t wish much of what I have been through on another person, but I don’t regret what I’ve experienced because these experiences have created the person I am today. I was never entitled and have had to work for anything and everything I have ever achieved. There was a point in my life where I was living off one can of tuna a day, and if I were lucky a baked potato, but I was warm and had a roof over my head, clothes to wear, a job, and all other basic needs met. To say that I have struggled compared to many who don’t have their basic needs met would be an insult to them. Once while I was attending the Yoga of Chant Retreat with Krishna Das in the Bahamas, he said something very profound that has stuck with me the last several years. I don’t remember his exact wording, but, in essence, it was something along these lines: “People do the best they can do at any given moment. It may not be what we would have done or what we would do, but they do their best. We should remember that and give people a break—don’t be so hard on others. “ He said it much more eloquently and simply than I do, but he was so right. There have been many times in my life where I have said or done something that I wish I could change, but at that moment I was doing the best I knew how. I try to remember that when people upset me; they are simply a reflection of myself. Christy Turlington is one of my biggest role models. Despite being elegant and beautiful, she is a yoga philanthropist and classy. You never hear of her doing anything that would embarrass herself, her family or her cause. I aspire to be like she is. I have varied travel interests, but didn’t start traveling until my 30s. Tropical destinations are my favorite, especially yoga related retreats. There is no more peaceful moment that rolling out your mat in an 80 degree, sunny, tropical place with a breeze blowing and practicing. However, I also have a proclivity toward British history and can wander around a castle for hours at a time, imagining what it would be like to be in the Court of Henry VIII at Hampton Court Palace or locked up as a prisoner in the Tower of London. Studying the history of a place before I visit allows for a better appreciation of my travels. I am not an overtly materialistic person, but I love essential oils and herbal teas. Teeki bell bottom yoga pants rank high on my list as well. As nerdy as this may sound, my current passions are yoga teacher trainings, both autodidactive as well as with those professionals who are qualified to mentor me along the path where I see myself walking 2, 5, or 10 years down the road. Networking and connecting with like-minded individuals is so important. I’ve learned over the last several years that we cannot grown in a vacuum and that we must allow others into our world while disconnecting from those who may not have our best interests at heart. If you want to become the best version you can of yourself, seek those who embody the qualities that you want to find in yourself and learn from them. This may mean stepping out of your comfort zone and even walking alone at times, but the end results will pay off.